I had the pleasure of interviewing Vanessa Roster, a UK Registered Nutritionist (ANutr) who specialises healing people’s relationship with food through Intuitive Eating. She’s worked with world leading companies such as Danone and she’s passionate about bringing the truth about nutrition to people, by delivering sounds scientific facts and breaking myths. Of course! I grew up in Norway and I wasn’t the healthiest kid on the street. I regularly enjoyed Kebab’s, burgers, ice cream and processed foods and didn’t think twice about it. Food for me was just something tasty to eat and fill your stomach with. That was it. However, in my early teens, when the use of internet became common (I feel ancient saying that! ), I started to educate myself about the different effects foods can have on the body. I was fascinated and blown away. There’s a whole different world going on inside our bodies, where foods interact with and influence all tissues and organs. For example, vitamin A supports eye health, Vitamin C prevent free radical damage and iodine supports thyroid function. I was loving soaking up this kind of information! I also learned how excess consumption of certain foods can have a negative impact on our health, such as saturated fat and its effect on heart health. It became real to me that nutrition has the ability to heal and the ability to kill. I was hooked and needed to learn everything I could. So I did. Ever since, I dedicated my life to become a powerhouse of nutritional knowledge in order to help people thrive and achieve the health they want. I spent all my spare time reading every nutrition book I could get my hands on, attended every nutrition workshop I could find, I studied Nutrition at one of the best Universities in London and started spreading the important message of nutrition and health via big companies. 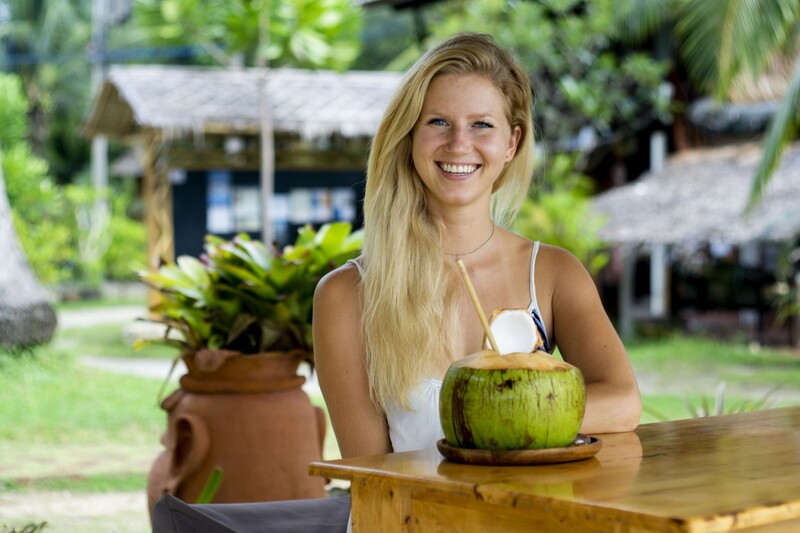 Now, I’m based at Orion Healing Center in Thailand and I enjoy working individually with clients in person and online, where I specialise in healing their relationship with food through intuitive eatingand plant based diets. What I love about Intuitive Eating is that it’s such an empowering journey which makes people the experts of their own bodies. Guiding and seeing people grow from a place of lack of self esteem and direction, to a place of confidence and self compassion is the best thing in the world. Like many of my clients, my physical and mental health also suffered as a result of following fad diets and poor nutritional advice, such as a lot of the unhealthy weight loss advice we see in the media. I developed eating disorders and I had a very difficult relationship with food. As a typical perfectionist with a competitive edge, I wanted to be the healthiest person on the planet, but I took it too far. I would yoyo between super restrictive “clean eating”, and bingeing on all the junk I could find. This was a miserable place to be and I felt like a complete failure. However, the combination of treatment, recovery and learning the psychological and physiological causes of disordered eating gave me even more powerful tools which I now use to help others. Now I’m not only equipped with the knowledge and information which leads to positive results, I also have personal experiences of many of the same problems my clients go through. This leads to a powerful connection and level of trust which makes my work extremely rewarding. You cannot heal others unless they want to heal themselves: My grandma always said: “You can lead a horse to water but you can’t make her drink”. This rings true in my profession. Once I became a source of knowledge, I wanted everyone to know what I knew. However, I was like an uncontrollable fire hose, projecting my opinions onto people who wouldn’t necessarily benefit from them. Just because you know something, doesn’t mean that it’s useful for everyone. Share your healing powers with those in need, but more importantly, share them with those who are ready to heal. There’s a unique solution to each person: There is no one-size-fits-all. Each and every single one of us are so different, including our bodies, our lives and our minds. Therefore, a solution for one person may not be the solution for another person. For example, just because one person benefits and thrives on a gluten free diet, doesn’t mean everyone should have a gluten free diet. We are all unique and that should be taken into consideration when treating a client. You cannot always trust science: It’s so important to scrutinise all sources of information. Many scientific studies are funded by pharmaceutical companies and businesses, tweaking the study design in order to create results which can lead to profit. Personally, I’ve had to become ninja at separating good science from bad science in order to gain reliable facts for my work. Jobs don’t come easy: When I was younger, I had the naive impression that all I had to do was go to University and jobs would come knocking on my door. I was proven wrong. In London, where competition is high and it’s hard to stand out, I had to do a lot of hustle and groundwork to get to where I am today. Poorly paid jobs, 12 hour days and little quality time became the norm for me. However, with persistence and hard work, I created the life of my dreams. You can get to where you want to be and achieve success. Just don’t give up. Science doesn’t have ALL the answers: Although I love scientific information and use it regularly to backup a lot of my work, I think it’s important to stay open minded to the mystical, unknown and unprovable.The human senses and perceptions are extremely limited and there are a lot of moving forces out there which we cannot scientifically prove (yet). Just because something cannot be proven doesn’t always mean it does not exist or isn’t true. For example, I find spiritualism fascinating and it’s an important part in my life, to balance out all my left brain activity! I think transparency is a choice and it will only benefit those with pure intentions. If your true desire is to help, heal and transform other people’s lives through who you are and what you do, then the more people know about you the better. Not just the highlights though. People want to see the ups and downs, the good and the bad, the yin and the yang. However, transparency is still a choice. I think it’s still fully possible to be a public person without revealing too much personal information. You don’t have to let everyone know about your latest relationship drama or what kind of underwear you use in order to help them. It’s down to the individual to find the level of personal details to share which they feel comfortable with. And that’s totally cool. At the end of the day, what’s most important is to provide value in an effective and enjoyable way. I find this very true, as some days I can be sitting in paradise feeling miserable, simply because of the thoughts I have. In contrast, other times I can look back at some of the worst moments of my life with immense gratitude. Your thoughts play a huge part in determining the quality of your life. Choose them wisely. To be honest, although I’m not a fan of labels, I would encourage as many as people as possible to go vegan. Choosing to eat plants instead of animals has proven to be one of the most effective ways to reduce disease, human and animal suffering, environmental damage, ocean dead zones and even preventing world hunger. Basically, the more people go vegan, the higher our chances are to save the planet and its inhabitants — including ourselves.